We are thrilled to welcome Theresa Curry, a long-time food writer who will be delighting us with tasty dishes and scrumptious treats as our newest culinary contributor! A few simple ingredients make an elegant appetizer, if you take some care with the preparation and presentation. Parmesan-pepper popcorn is easily put together, and is served at The Inn at Little Washington, America's first five-star country inn with a dose of truffle oil and some truffle shavings. Chef Mike Lund, who ran the kitchen at The Inn for many years and is now the owner of Mike Lund Food, says the secret to elevating this popcorn out of the ordinary is a little thought to mis en place. That's what chefs call preparation -- do it all ahead and have it handy, so the warm butter goes on the warm popcorn, and the other ingredients adhere evenly. Take some time to distribute the oil and butter throughout the popcorn before sprinkling on the cheese. Heat the butter and olive oil in a small saucepan over medium-low heat until melted and warmed through. Place freshly-popped popcorn in a large mixing bowl. Pour the butter-oil mixture along the inside walls of the bowl, then stir quickly to coat the popcorn. Add the cheese and parsley; toss to distribute evenly. Season with salt and pepper to taste. Serve the popcorn in small cardboard boxes or small bags. And, if you just happen to have some truffles or truffle oil around, substitute the truffle oil for the olive oil and grate a truffle over the top of the popcorn. Long-time food writer Theresa Curry tells stories about food and the people who prepare it and is grateful to have chosen a career that has her shelling muddy crawfish one day and tasting fine wine the next. One current project is working on a series of food stories as part of the documentary division of Alpha Vision Films. Theresa Curry is a wonderful writer. So GLAD you've snagged her! We are beyond excited to have Theresa join our team! Nothing teases those taste buds like the smell of fresh popcorn. And this recipe looks scrumptious. I must try it! Just love the smell of fresh popcorn, instantly makes me think of the weekend! My children are popcorn fiends and never end a Saturday night without a bowl! It is absolutely scrumptious,the parmesan-pepper kicks it up deliciously! This looks so yummy! Thanks for the recipe. I am dying to go stay at the Inn at Little Washington. I have been hearing wonderful things about The Inn! If I ever head that way, I know where I will be staying! I knew you would like this, perfect Saturday night snack! Oooh that sounds like the best flavor combo!! 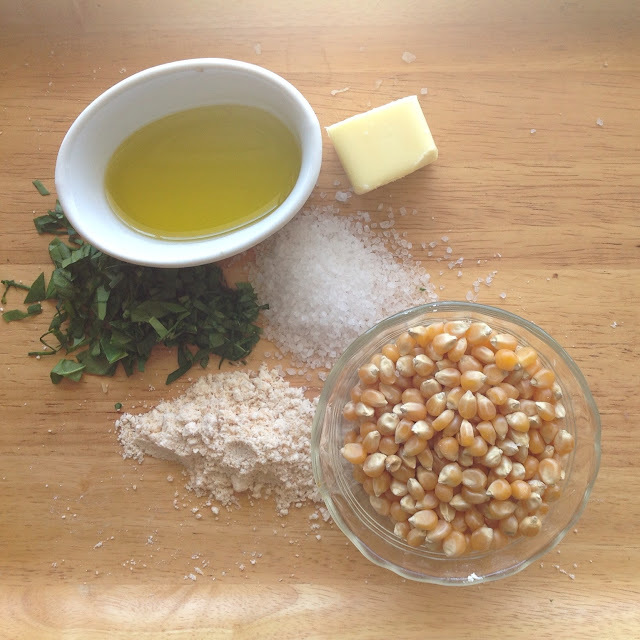 What a great idea to pour the butter / oil mixture along the sides of the bowl to avoid soggy popcorn ! I can't wait until my fresh parsley is ready to pick! Oh, my I may have to try this! I've been loving nibbling on Parmesan on my pasta lately and adding it to popcorn sounds delicious. Makes me think of all the other herbs I never thought of pairing with popcorn! Herb garden, here I come!